Neil MacGregor travels the Silk Road to western China and tells the story of silk with the help of a fragile painting telling a story of industrial espionage. Throughout this week, Neil MacGregor has been exploring the world of the late 7th century, with objects from South America, Britain, Syria and Korea. Today's object is from the 4000 mile tangle of routes that has become known as the Silk Road - that great conduit of ideas, technologies, goods and beliefs that effectively linked the Pacific with the Mediterranean. His chosen object which lets him travel the ancient Silk Route is a fragile painting telling a story of "industrial espionage". It comes from the Buddhist kingdom of Khotan, now in Western China, and tells a powerful story about how the secrets of silk manufacture were passed along the fabled route. The cellist and composer Yo Yo Ma, who has long been fascinated by the Silk Road and who thinks of it as "the internet of antiquity", and the writer Colin Thubron consider the impact of the Silk Road - in reality and on the imagination. A History of the World in 100 Objects - objects related to money, trade and travel. 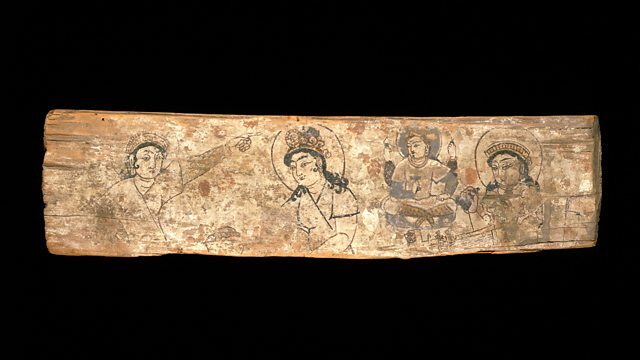 This painting on a wooden panel shows scenes from the Central Asian story of the Silk Princess. According to this legend, a Chinese princess smuggled the secret of how to make silk out of China and into the country of her new husband, the king of Khotan. As she was a princess the border guards did not dare search her. In this painting her elaborate headdress conceals the cocoons of the silk moth and the seeds of the mulberry tree. The painting comes from a Buddhist shrine in Khotan in Central Asia. This was just one of many oasis cities along the Silk Road. Silk and other goods were traded along this route from China to India, western Asia and the Mediterranean. Monks, merchants and other Silk Road travellers, stimulated the spread of Buddhism from India to China, Korea and Japan and many Buddhist monasteries and shrines were created along the route. A silkworm multiplies its weight 10,000 times from when it hatches until it is ready to start spinning its cocoon. When handling the wooden panel with the depiction of the Silk Princess, one is surprised about its weight. Having been buried under the desert sands for well over a thousand years, any humidity has evaporated from the wooden panel and it has become extremely light. Apart from the loss of some colour pigments on its surface though, the lively and linear brushstrokes of the painter are still clear. Because wood was so precious along the Silk Road, most of the painted panels of this kind were painted on both sides with different scenes, although not this one. What is interesting about this object panel is perhaps that it found its place in a Buddhist shrine and therefore had its place in a religious context. It is evidence for the close interaction between religion, ritual and daily life of Ancient Khotan along the Silk Road. Furthermore, written sources and archaeological evidence prove that the production of silk and silk manufacture technology was invented in China about 4,000 years ago. Around the second millenium BC the precious material was produced for the Chinese aristocracy and must have had a similar status as ritual bronzes. Historians agree that the knowledge and technology of silk production gradually travelled westwards from China via the Silk Road to Byzantium and then to northern Europe. This happened around the sixth century, approximately at the time, when this panel was painted.